A member of the Feldspar Orthoclase family, the moonstone is a semi-precious gem that occurs in nature in a limited quantity. The stone is so named because of its magical shimmer resembling the moon and it exhibits a phenomenon called adularescence as there is a whitish blue light that seems to hover over the stone's core. The stone is found in a range of colors like white or opaque blue. 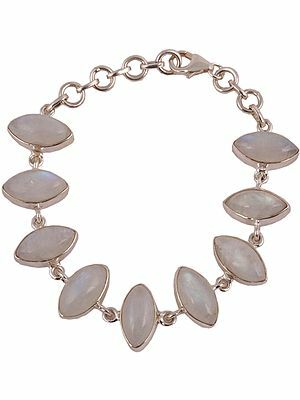 Sometimes, moonstones are also found in colors like brown, green, yellow, grey, orange and black, but these are very rare in occurrence. 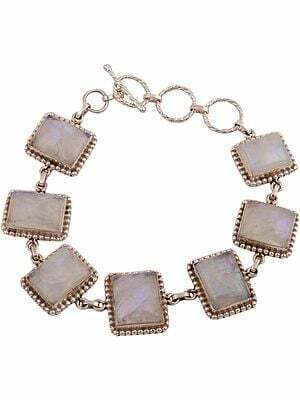 Moonstone jewelry looks simple yet elegant. 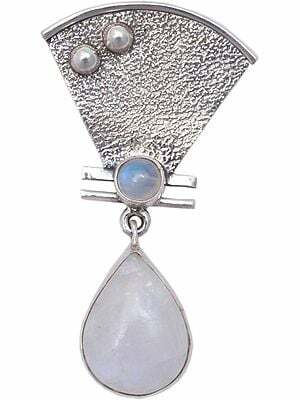 Exotic India offers the largest selection of moonstone jewelry in sterling silver. From classic earrings to dazzling bracelets and rings, shop for the most beautiful jewelry at the best prices.